That was made clear in the many entries we received for the Apparition Hill contest, and we were absolutely overwhelmed with the powerful stories that you shared with us. Our production team and committee had a huge and difficult task when it came time to choose the final people who would go to Medjugorje on this trip. We watched and considered every entry, and ultimately we decided to choose entrants with varied backgrounds so as to ensure objectivity for the investigation. 1. SECOND FILM! – We will bring a second group of 5 people to the Medjugorje Youth Fest in August for a second film, including some of the entrants from this contest. See CrossMountain.tv for news about that film. We are accepting new entries for people aged 18 to 30. If you entered the Apparition Hill contest, we would love you to resubmit to the new one! 2. EXTRA WINNERS! – Thanks to the generosity of some of our supporters, we are bringing more than just 5 people on the main Apparition Hill trip. See the winners below. 3. SPECIAL PILGRIMAGE! 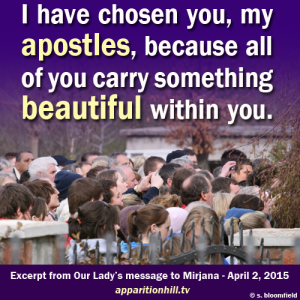 – We feel that everyone who felt the call to enter this contest is likewise being called to visit Medjugorje. For that reason, we’ve put together a special Apparition Hill Pilgrimage in early June which will be led by filmmaker Sean Bloomfield and the film crew. Parts of this pilgrimage will be filmed for the documentary, and the crew will be conducting interviews and shoots during this time, so pilgrims will experience Medjugorje in a truly unique way. We worked out discounted rates for anyone who entered the contest. So, if you were not chosen for one of the free trips, we have some suggestions on how to raise enough money to come on a pilgrimage. LEARN MORE. Without further ado, we are pleased to announce the winners of the 2015 Apparition Hill contest.